The woman’s eyes stared vacantly into the sky. When the first boom shattered the bliss and the haze of white smoke washed over the finish line, I could see in the eyes of the woman what had happened. She wasn’t breathing. She wasn’t moving. Her eyes appeared lifeless as she lay beside the metal barriers on the sidewalk, where dozens of people were sprawled on the concrete, their limbs mangled, blood and broken glass everywhere. I had been in a crouch shooting video of runners taking their final steps of the race, maybe 10 feet from the blast. I saw runners in front of me fall, at least one of whom appeared wounded. Those beside me at the center of the finish line — Marathon volunteers, security, fellow journalists — fell back as the ground trembled. Just seconds after the first explosion rocked the area near the Boston Marathon finish line at about 2:50 p.m., there was a second blast a few blocks away on Boylston Street. Someone beside me said he saw a red flash. Others close by told me they felt the spray of what they thought were shards of shrapnel. My ears were ringing from the blast, my eyes stinging from the smoke. Time felt like it had slowed down — the disorientation, the confusion, the strange silence stealing my breath and delaying my ability to comprehend. Seconds later, it became clear that it wasn’t a gas explosion or some machinery malfunctioning. 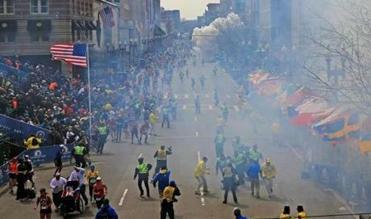 When we heard the second blast a few blocks down Boylston, everyone who wasn’t running was now ­running. Many were fleeing, but many were running to the wounded. They ripped down the metal barriers separating the runners from spectators. Unsure of whether there would be another explosion, these strangers risked their lives to help other strangers, performing CPR, comforting those in shock, and carrying the wounded to the nearby medical tent. Alix Coletta, 26, a nurse in the medical tent, later told me she and others had treated dozens of people — including children — for severe trauma, massive bleeding, and heart problems. At the center of Boylston Street, with hundreds of people running in every direction, I watched as the wounded cried for help. Those still walking began searching for friends and relatives. Andrea George, 39, who was in the stands across from the first blast, told me a friend was standing a few feet from where the bomb exploded. As sirens blared, police poured in, and FBI agents arrived, I watched as flags from around the world still fluttered in the breeze, a symbol of the thousands of people from nearly every corner of the planet who had come to help celebrate ­Patriots Day in Boston. Many were fleeing, but many were running to the wounded. They ripped down the metal barriers separating the runners from spectators. When I was finally escorted out of the area, police and emergency officials were still carrying the wounded away. I was looking for the woman whose eyes will continue to haunt me. She was gone. Only the blood remained.